PHEAR, Ontario Canada’s masters of Power/Thrash have inked a Worldwide Record deal with Pittsburgh, PA. based RFL Records. 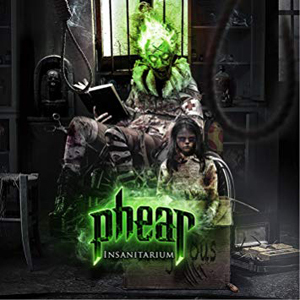 With the sonic power of IRON MAIDEN blended with JUDAS PRIEST, PHEAR is set to deliver their message to a global audience with the release of their first full-length album Insanitarium on November 23. So who are PHEAR? Well, it turns out these Canadian's have some history. Patrick Mulock (Lead vocals): Patrick had a 2 album stint with Metal Blade Recording Artists EIDOLON, with Glen and Shawn Drover, formerly of MEGADETH. Prior to that, he fronted Canadian band RAMPAGE. Pat Rogers (guitars): Pat is also a member of the Toronto band PROFANER who won the 2016 Metal Battle Canada competition, and eventually international 2nd place at the Wacken Open Air festival. Pat is the newest member of PHEAR, and the band is proud to have him on board. Chris Boshis (Bass Guitar): Chris spent time in local band CONFLICTED. He has also auditioned for MACHINE HEAD and DISTURBED. Graham Stirrett (Guitars): Graham came to PHEAR from local Death Metal Band A SIN FOR A PRAYER. He continues to release solo material as well as playing in PHEAR. Chris Lewis (Drums): Chris spent time in local acts and was the original drummer in RAMPAGE. When asked about what is up and coming on the bands horizon the response is positive….”EVERYTHING!” / “Bigger, Better, Brighter and louder!” PHEAR just want everybody out there to know who they are. When asked about what drives the band, Lead Vocalist Patrick Mulock quickly responded “We love what we do and want all of our fans to have a great time listening and watching us do it! We treat every show as an EVENT, A MOMENT, A MEMORY! We want to leave our mark! PHEAR possesses a melodic metal, hard rock sound that is truly unique and offers something for a wide variety of metal audiences. A perfect mesh of rhythm guitar, bass, drums and an expansive vocal range allow you to truly feel the music. Every element of PHEAR’s addictive sound and vintage style presence will keep you screaming for more……Get PHEAR in your ears today, it’s true Insanitarium.